Whether the aluminum F-150 holds on to its higher resale value will depend on how the total cost of ownership plays out. DETROIT (Bloomberg) -- The resale value of Ford Motor Co.’s new 2015 F-150 pickup jumped 11.5 percent over last year’s model as improved fuel efficiency outweighed concerns over repair costs for its aluminum body, according to TrueCar Inc.’s ALG division. ALG estimated a 2015 F-150 will retain 58 percent of its value after three years, up from 52 percent on the 2014 model, Eric Lyman, ALG’s vice president of industry insights, said in an interview on Wednesday. Toyota Motor Corp.’s Tundra has the highest resale value among full-sized pickups, while Ford’s truck is the best among U.S. automakers, Lyman said. Ford’s use of aluminum, which costs more than steel, had raised concerns the F-150 would be expensive to repair and insure. ALG, which has set resale values on autos for more than 50 years, didn’t penalize Ford for using aluminum because the light-weight material has been successfully used for years on Jaguar luxury cars, Lyman said. Ford developed the aluminum Jaguar models before selling the brand in 2008 to raise cash. 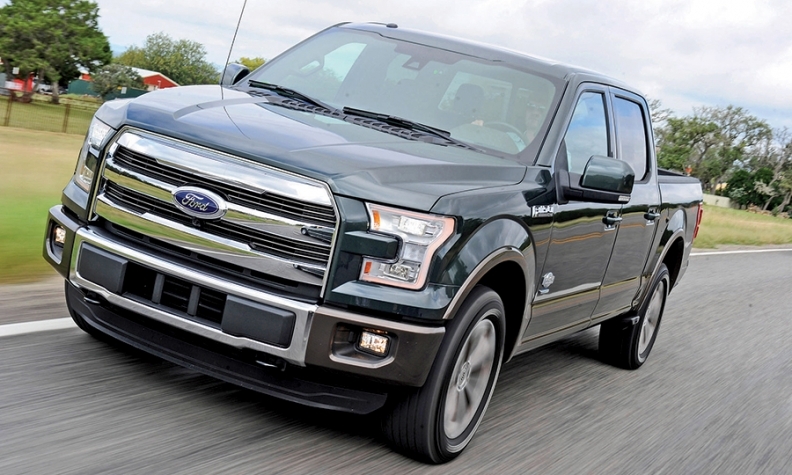 The new F-150, the top-selling vehicle in America, achieved a 5 percent to 29 percent improvement in fuel economy, primarily by dropping about 700 pounds in weight through the use of aluminum body panels. The Environmental Protection Agency says the most fuel efficient F-150 gets 26 miles per gallon on the highway, the best of any gasoline-powered half-ton pickup on the market. Ford has a lot riding on the F-150. The $8,000 to $10,000 in gross profit each truck hauls in accounts for 90 percent of Ford’s global automotive earnings, Morgan Stanley has estimated. Ford raised prices on the new truck by 1.5 percent, or $395, on the base model XL, which starts at $26,615, to 7.9 percent, or $3,615, on the high-end King Ranch version that starts at $49,460. The boost in resale value “gives customers a great return on their investment,” said Mike Levine, a Ford spokesman. While a four-wheel-drive F-150 SuperCrew XLT model retains 58 percent of its value after three years, a similarly equipped Toyota Tundra still commands 63 percent of its original price, ALG estimated. The Tundra resale value, also known as residual value, is up from 59 percent last year. General Motors' 2015 Chevrolet Silverado and GMC Sierra each retain 51 percent of their value after three years, ALG projected. The Silverado is up from 48 percent last year, while the Sierra held steady at 51 percent. Fiat Chrysler Automobiles NV’s 2015 Ram 1500 will hold on to 46 percent of its value after three years, down from 49 percent on last year’s model, ALG estimated. Nissan Motor Co.’s 2015 Titan pickup will retain 42 percent of its value after three years, up from 41 percent on last year’s model, ALG said. Whether the F-150 holds on to its higher resale value will depend on how the total cost of ownership plays out, Lyman said. Part of what drives up the F-150’s value is the success of its higher-priced models, such as the King Ranch and the Platinum edition, which each top $50,000, Lyman said. As Ford converted two plants last year to build the new truck, F-Series sales fell 1.3 percent to 753,851, though it remained the nation’s top-selling vehicle for the 33rd straight year. F-series sales were up 7 percent in the first two months of this year and the automaker said output of the new model will expand to a second factory this month.